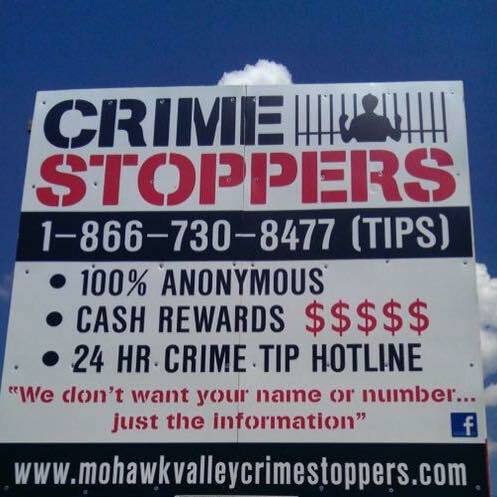 Mohawk Valley Crime Stoppers began in 2015 from the efforts of our Board Members and Local Police Departments. There were no Crime Stoppers Programs in Central NY. Mohawk Valley Crime Stoppers Oneida County is compromised of diverse, active and dedicated community representatives. A top notch Board of Directors from Oneida County joined together with a combination of efforts by local media, businesses, civic and social clubs, local Law Enforcement Agencies and the public. Donations of airtime, newspaper advertisements, monetary cash donations and reward money have established Mohawk Valley Crime Stoppers of Oneida County as an effective tool to fight crime in our local areas. We are dedicated to making the community a safe place to live. Crime Stoppers mission is to work alongside with the public/community, Police and the media to gather information anonymously to help solve crimes. Crime Stoppers provides a method for Local Law Enforcement to receive information on crimes. These efforts increase tips, which in turn increases arrests in our communities. We are dedicated to making the community a safe place to live.